Wakayama-City is a gem “hidden” only 1 hour away from Osaka and 40 minutes from Kansai Airport. 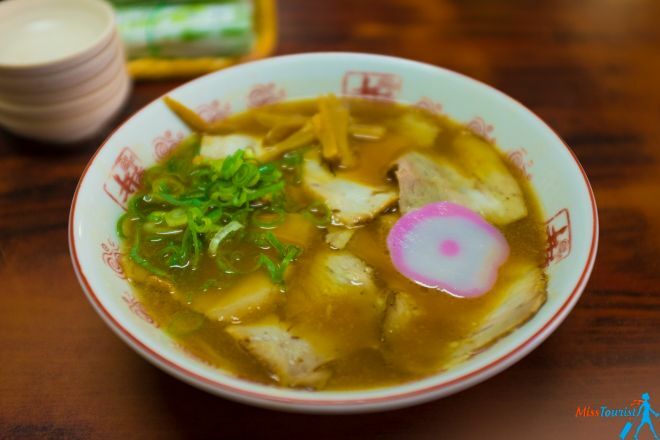 Wakayama is the place where you will find the best ramen soup, the most delicious tuna sashimi, beautiful hot springs and beaches, shrines and temples and more! 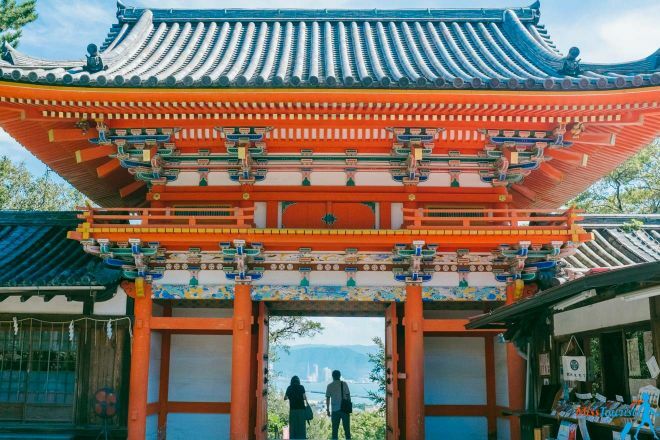 If you are planning to visit the off the beaten path parts of Japan, you should definitely add Wakayama to your list, at least for a day! During my entire trip there I felt like I was the only tourist, so I could have all those special places to myself! 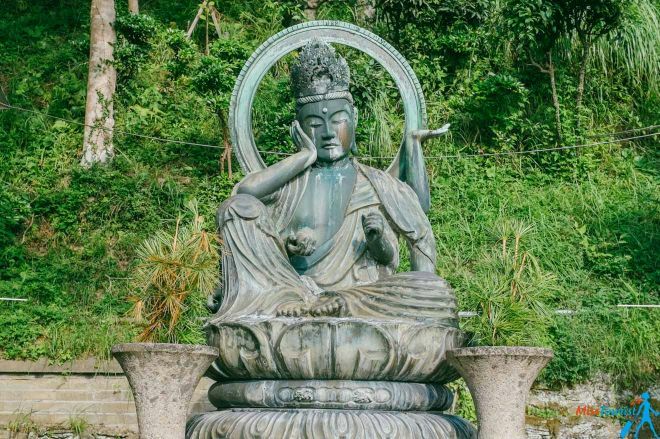 I visited some shrines and there were only a couple of locals there, so I could really enjoy the experience and feel the authentic vibe of each place, listen to the sounds of nature and relax. Wakayama is not about the hustle and bustle of crowded touristic places such as Tokyo, Kyoto or Osaka. 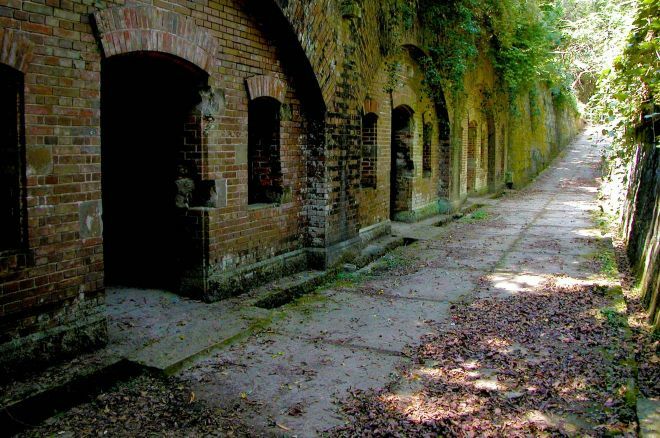 Instead, it is a town of peace, where you can walk around and take your time on discovering the hidden gems. I suggest you stay for about 2 days in Wakayama, Japan, if not more. Depending on your desired itinerary and your list of to-do things, you will have enough time to experience some great attractions, see some authentic shrines and witness the true spirit of the city! I was invited to the city by the wonderful people from My Secret Wakayama and I spent 2 beautiful days in this charming city. On the first day I visited the entire Marina City area, and on the second one I visited some shrines and ate some delicious ramen. 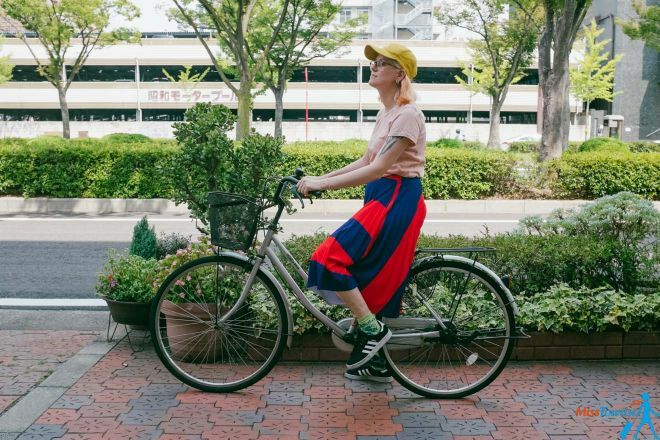 I rented a bike while I was there because I wanted to truly experience the city and wander on the streets at my own pace. You can do the same or you can take a bus to get around. There are also trains that are accessible and you can find everything about transportation in Wakayama at the end of the article. Regarding Japan prices, the local currency is the yen (¥). 1.000¥ are equivalent to 8.8US$. 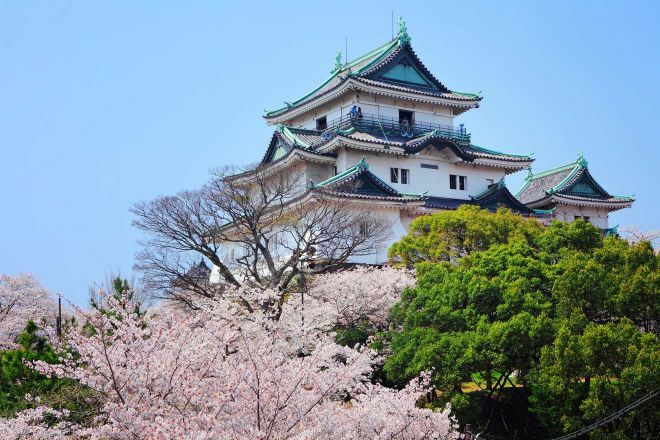 Wakayama Castle is one of the most iconic attractions of the city and a must-see during your stay, regardless of how short it is! Wakayama Castle is a historical site dating from the 16th century, but ever since then it was built, taken down and rebuilt again several times. 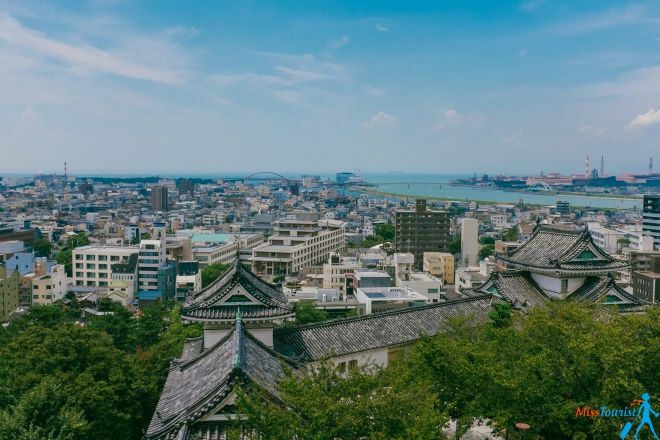 The last time it was rebuilt was in 1958, after World War II and since then it stands proudly overlooking the entire city and it is a symbol of Wakayama’s history. 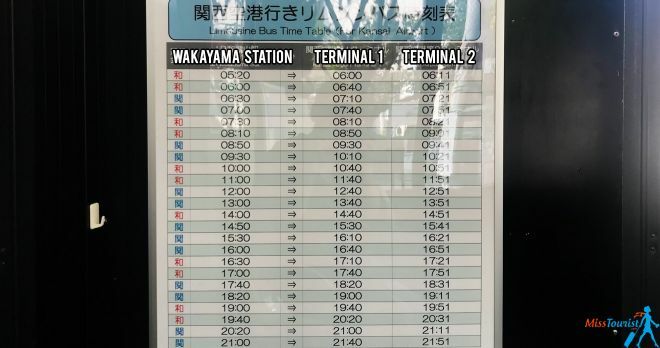 How to get there: You can take the bus from Wakayama JR Station (any bus from Platform 2 such as 25, 26, 30, 33, 24 etc.) to Koen-Mae stop, about 7 minutes. Price of the bus ticket is 230¥. Read more details about Wakayama buses and transportation at the end of the article. Price: The admission fee to the castle was 410¥ when I went (August 2018), but you can visit the surrounding area, the zoo and the gardens for free. The admission ticket includes the visit to the museum inside the castle and you can also go up to the Castle Tower to see the stunning view over the city. Pro tip: After you finish visiting the castle, go to Wakayama City Hall which is very close. Take the elevator up to the last floor and enter their restaurant. 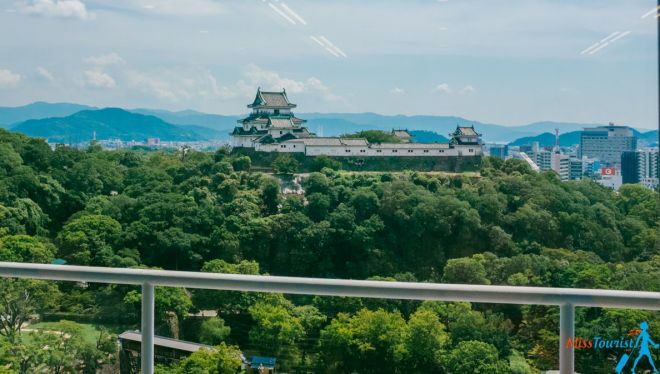 You will have a beautiful panoramic view of Wakayama Castle and you can even serve a set menu for lunch if you want! 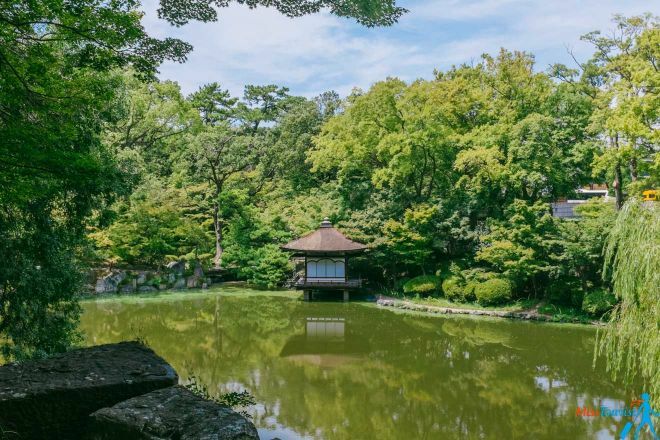 Momijidani Garden is right near Wakayama Castle and it is a gorgeous oasis where you can rest and drink a cup of traditional green tea (matcha)! 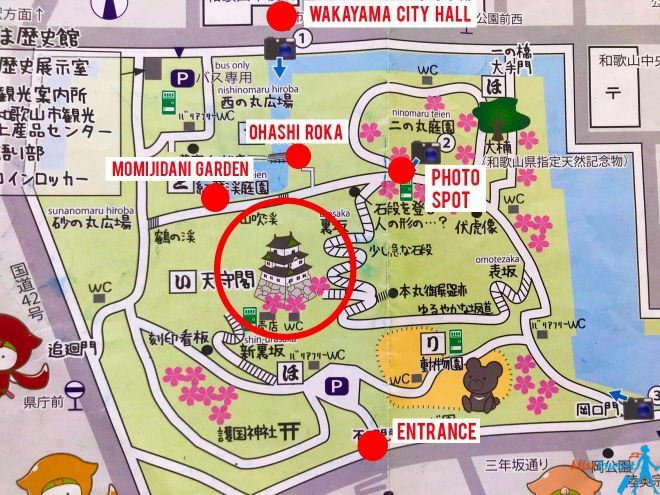 After you are done visiting Wakayama Castle, you can keep walking and you will get to Momijidani Garden. It is a very small garden with a pond, a wooden bridge, and many trees. I was simply mesmerized by the color of the water and the way the sun was reflecting through the leaves! 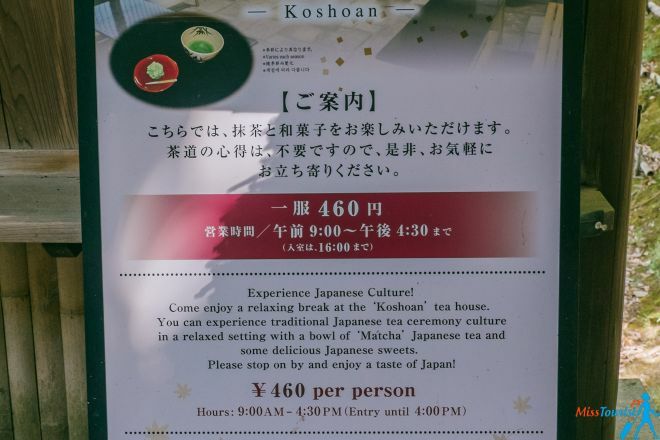 If you want to take your Japanese experience to a whole new level, you can participate in the tea ceremony at Koshoan Tea House, right near Wakayama Castle and the gardens. 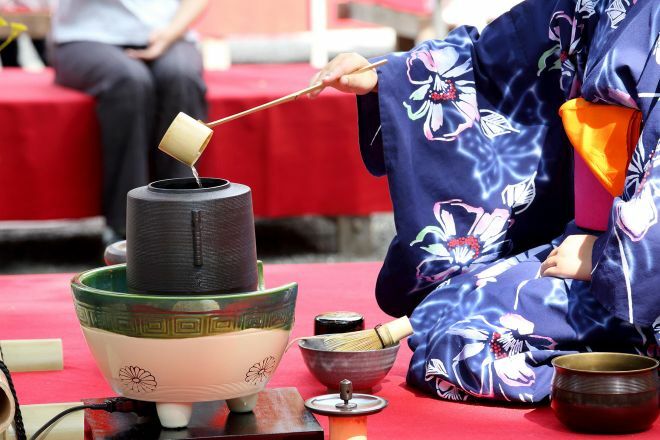 The tea ceremonies are taking place between 9 AM – 4:30 PM and the last admission is at 4 PM. 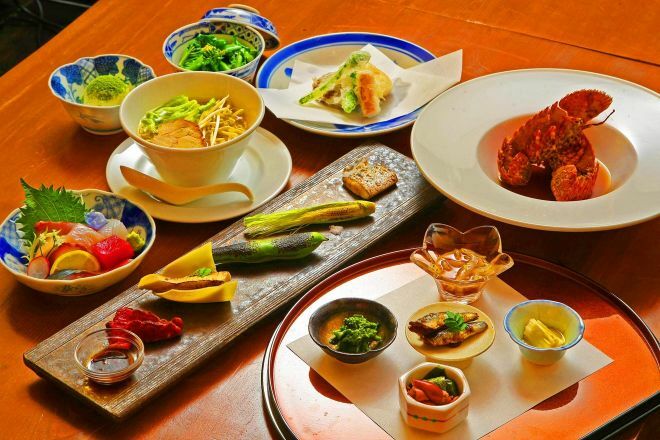 You will get to taste a bowl of matcha tea and some traditional Japanese sweets. Unfortunately, the tea house was closed when I visited, but I participated in a tea ceremony in Kyoto and it was one of the highlights of my Japan trip! How to get there: Go down from the castle using the Back Path. Turn left and you will find the garden with the pond. It is kind of hard to miss it, as it is so close to the castle. 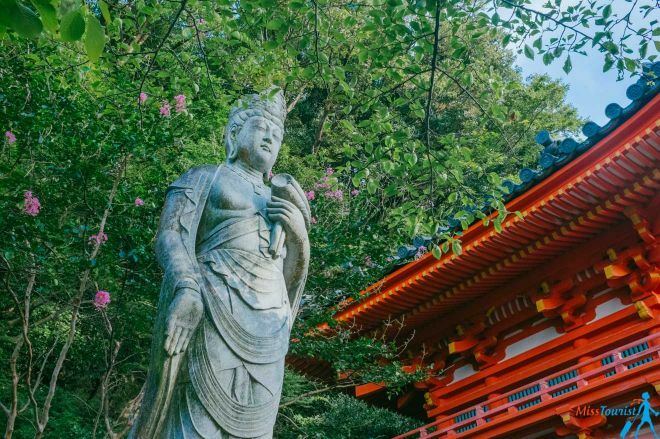 Wakayama-City is full of beautiful temples situated at the end of hundreds of steps, but Kimii-Dera is definitely the largest and most stunning one in the city! 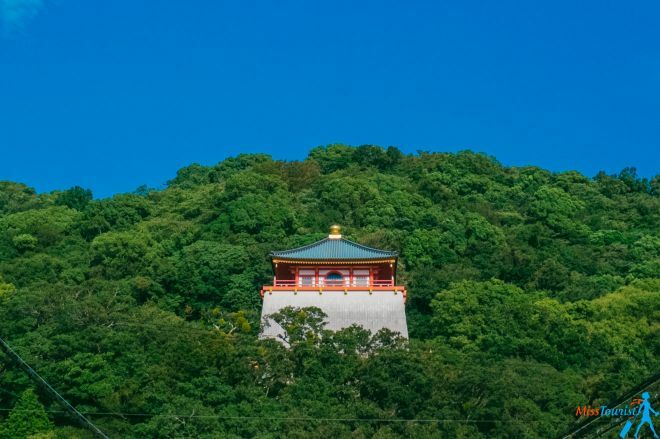 Founded in 770, Kimii-Dera temple sits proudly at the edge of Mt Nagusa-Yama, 231 steps above the city. I know it sounds like a lot of effort, but the view from above and the entire scenery is definitely worth it! “Kimii-dera” means the “the temple in Wakayama with three fountains”. The entire site is very peaceful and it is the perfect place to have some rest after the long way up. The scenery includes a pond, fountains, many shrines, and small statues and there are also some cafes, vending machines, and souvenir shops on the way up. There were only a couple of locals visiting when I was there, so I really felt like I had the entire place to myself! If this temple was so beautiful in August, I can only imagine how splendid the entire scenery is in spring, with the cherry blossoms or during autumn, when there are red leaves everywhere! One of the highlights of this temple is the Buddha Statue called “Kimii-dera Dai Kannon”. It is a mesmerizing 12-meters tall golden statue made of wood, built in 2008 and it is the biggest wooden statue in Japan until today! The statue depicts Daisenju-juichimenkanzeon-bosatsu-zo (try to pronounce that! 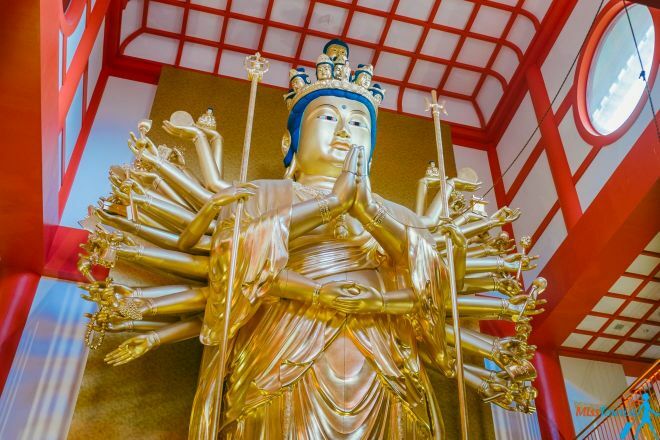 ), a Buddhist saint with 100 hands and 11 faces, and it is super impressive! 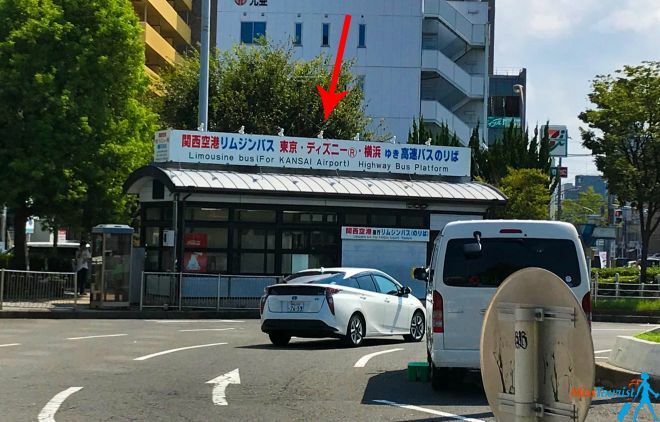 How to get there: Take the buses 40, 42, 43 (Platform 1) or 20, 121, 22, 122 (Platform 2) from Wakayama Station and get down at Kimiidera station (about 25 minutes). The temple is a 5-10-minutes long walk from the station. Price of the bus ticket is 400¥. 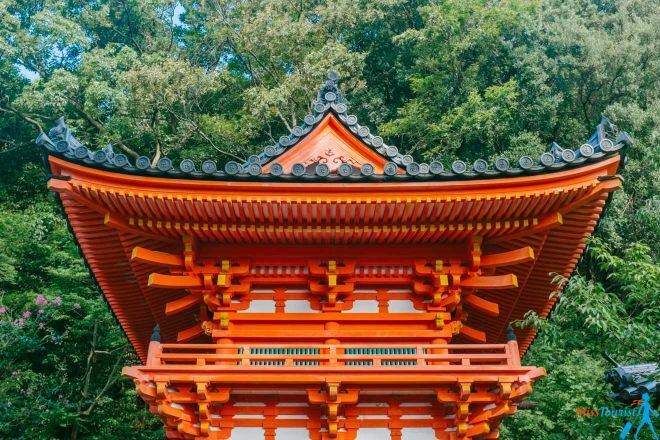 Built in 1621, Kishu Toshogu Shrine is an important cultural property in Japan settled into a dark green forest! Kishu Toshogu Shrine has some of the most beautifully carved wooden gates from all the temples I’ve seen in Japan! The gate is very colorful and when you are standing at the top of the 107 stairs that go up to the temple, you will be able to see Wakayama Marina City far away on the horizon line, the artificial island in Wakayama which I am talking about at no. 7 on this list. Again, while I was there I only saw a maximum of 5 local men who came to pray at the temple. Other than that, I was all by myself and I could take my time and admire this historical site. The entire atmosphere was very serene and there were cricket sounds all over the place! How to get there: From Wakayama Station you can take bus no. 24 or 30 (Platform 2) and get down at the stop “Gongenmae” (about half an hour). The shrine is a short walk from the bus station. Price of the bus ticket is 380¥ (for bus 24) or 500¥ (for bus 30). Wakayama Marina City and Porto Europe were some of the most special and unique things I saw during my Japan vacation! Marina City is an island resort and a very special experience in Wakayama. 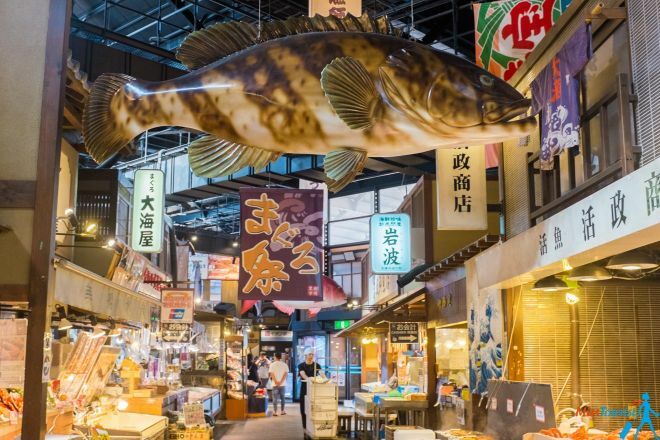 The island includes Porto Europa (amusement park), a fish market, a fresh fruit market, a stunning hotel and an onsen (hot communal baths that are super popular in Japan)! Porto Europa is an amusement park with different attractions such as roller coasters for kids, a ferry wheel, a water slide, carousel and more! The entire area is made to resemble Italian, French and Portuguese streets and they made a really good job! You won’t even feel you’re in Japan anymore with the stunning ocean views and the pleasant breeze. There are also some European-style restaurants and cafes there where you can enjoy a nice meal. If you are not fond of the amusement park attractions, I suggest simply walking around the place and admire the architecture. You will get many great photo opportunities on those cute little streets, especially if you are going in the afternoon! How to get there: From Wakayama Station you can take the bus no. 42 (Platform 1) or 121, 22, 122 (Platform 2) for Marina City and get down at the last station (Marina City). Price of the ticket is 520¥. You will see Porto Europa right from the start. It is only a short walk from the bus station. Price: The entrance fee to Porto Europa is 3.500¥ for adults and 2.900¥ for children. 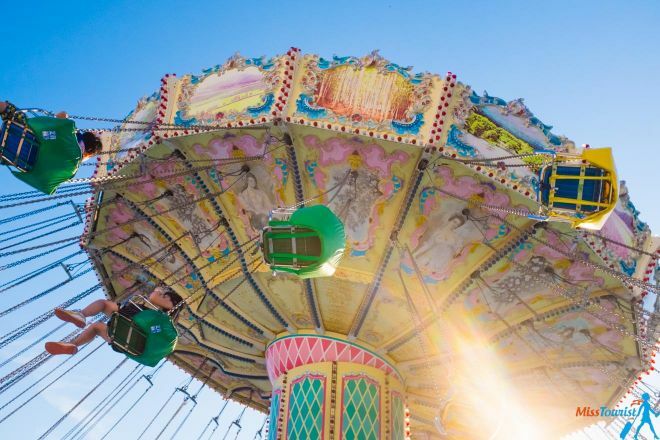 There are some rides that you have to pay individually for. It is free to walk on the streets. 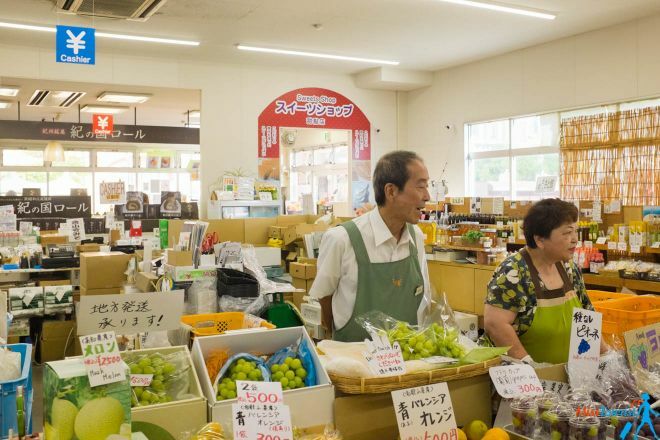 If you want to taste some delicious locally produced Wakayama fruits and veggies, here is the perfect place to do it! Kinokuni Fruit Village is a small fruit market full of fresh fruit and vegetables. All of the fruit produced there is locally grown and it is super tasty! You can walk around and sample different types of fruits or products such as freshly squeezed juices and more. 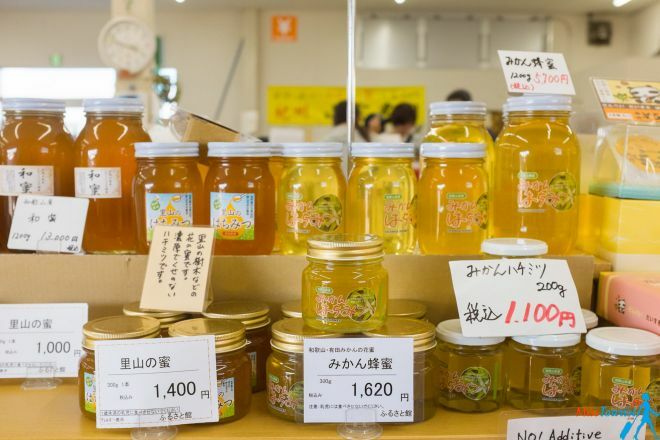 This is also a very good place to buy souvenirs such as honey (I bought some orange blossom honey there that I simply love! ), ginger ale (famous local drink), sauces, sweets, and cakes! How to get there: Kinokuni Fruit Village is right across Kuroshio Market, very close to “Marina City” bus stop. Price: Access to Kinokuni Fruit Village is free. Wakayama is known because of the multiple onsens they have there, and Kishu Kuroshio is probably one of the most beautiful ones! An “onsen” is a public Japanese bath with hot spring water where Japanese people go to bathe and have some relaxation time. The rule is that you have to get into the onsen completely naked (no underwear or swimwear allowed!) and I must say, this is a truly unique experience. Even though I was a bit shy at first, nobody bats an eye as they are very used to this ritual, so you will slowly learn how to feel comfortable in your own skin. There are some steps that you have to follow for bathing in an onsen, though. At first, you have to enter the facility, take off your shoes, purchase your ticket, receive your towel, and leave all your stuff, bags and clothes at the special locker. The onsens are divided into female and male zones, so you won’t have to worry about this. Then you have to wash yourself at the communal shower and only after this step you are allowed to enter the onsen. 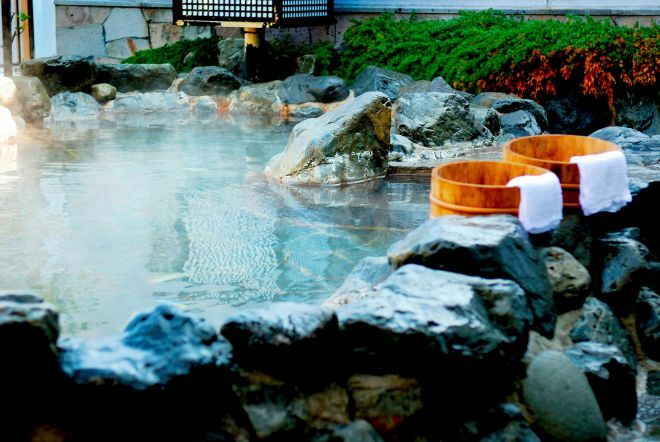 Sit there, relax, then go and wash yourself the second time, get back into the onsen and you are done! Kishu Kuroshio Wakayama Onsen has an indoor and outdoor bath with water pumped from 1.500m below sea level. The outdoor one is amazing as you will have a stunning view over the city! I went at around 9 PM and the weather was perfect, I could feel the ocean breeze while I was soaking in the hot water. The onsen is open until 12 AM. Tip: You can’t take photos at the onsen. You cannot go into the onsen if you have tattoos. The way to go around the rule is to cover your tattoo with a bandage or even a band-aid it if is small. It is important that the locals don’t see your tattoo, as this is a taboo subject for them. I can’t assure you that this will work in every onsen and it also depends on how big your tattoo is. How to get there: The onsen is right near Marina City Hotel, across the street from Porto Europe, very close to Marina City bus station. Price: Admission fee is 830¥ for adults (1.000 with the towel included) and 520¥ for children (600¥ with the towel). Here are some of the things that were on my to-do list for Wakayama, but because I was only there for 2 days, I didn’t have enough time to cross everything from my list! 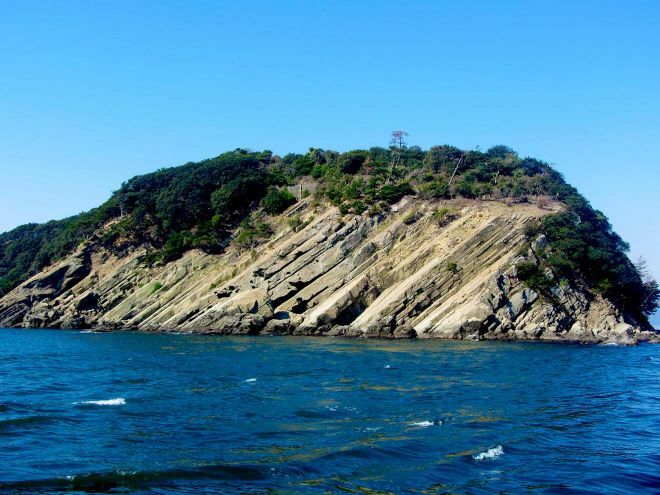 Tomogashima Island is a chain of 4 beautiful islands: Jinoshima, Torajima, Kamijima, and Okinoshima. You can only take a boat to Okinoshima Island and the ride there is totally worth adding it to this Wakayama, Japan guide, as it is a very beautiful island, full of fortress ruins dating from the World War II. 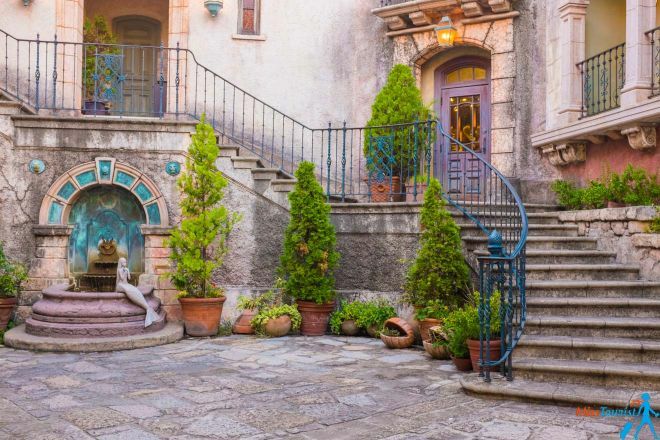 You will feel like in a Miyazaki anime while wandering around the ruins and small streets of the island! Tip: Make sure to take some food and water supplies with you on the island. Some insect repellant spray will also be useful, as there are many mosquitoes and insects on the island. If you want to explore everything at your own pace, consider investing around 4 hours in this island trip. How to get there: From Nankai Wakayama Station you take the train on KADA line to Kada Station. From there, take the ferry from Kada port for 20 minutes and you will arrive at the island. Price: The train ticket to Kada station is 300¥ one-way and the ferry is 2.000¥ roundtrip. Yes, you read that right! Wakayama has a cat as a train Stationmaster! 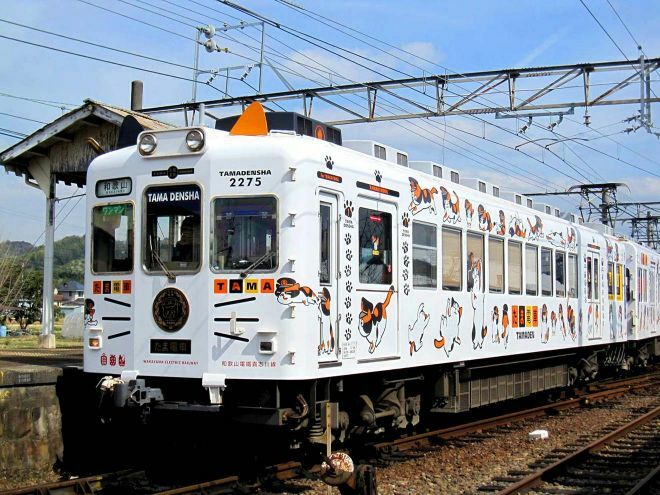 Wakayama Electric Railway has one cat to rule them all: Nitama! 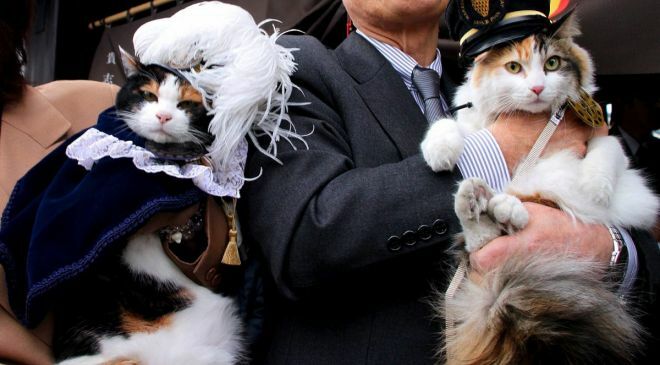 Actually, the first stationmaster cat was Tama, which was “on charge” between 2007 and 2015. After she died, her apprentice (Nitama) took her place and Tama was transformed into the goddess of Wakayama Electric Railway and Local Public Transport! She even has a shrine at Kishi Station. You can find Nitama at Kishi Station. There are 14 stops from Wakayama Station to Kishi Station and on your way there you will enjoy some beautiful scenic landscapes. Like any other employee, Nitama has some specific working hours and she takes the day off on Wednesday and Thursday. On her regular days, you can see Nitama peacefully sleep in the front cabin of the train! As a bonus, Wakayama Electrical Railway has 4 themed trains: a Strawberry Train, an Omocha (Toys) Train, a Tama Train (Tama the cat!) and an Umeboshi Train (plums). Each one of these trains is unique, decorated according to the specific theme. Tama Train is probably the cutest train ever! Price: The train ride from Wakayama Station to Kishi Station is 400¥ (200¥ for children) one-way and it takes about 35 minutes to get there. You can buy the one-day ticket for 780¥ (adults) and 390¥ (children). Out of all the shrines in Wakayama, Awashima is definitely the most special and spooky one! The reason why I am saying this is because Awashima Shrine’s altar is full of dolls! And when I say “full” of dolls, I mean over 20.000 dolls – from Japanese women to owl and other colorful animals. The entire site has a very mysterious and creepy mood and I am sure you will be intrigued by the entire setting! 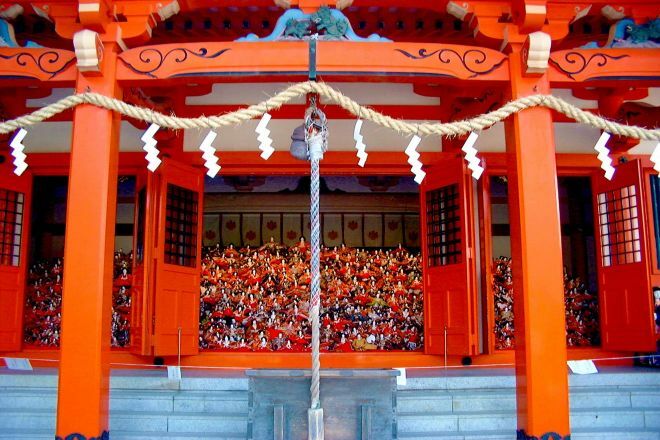 All the dolls at the shrine were sent by people all over Japan, as they are used in a special ceremony in March. Even though it may not sound like such a big deal, I am sure being there is simply incredible. 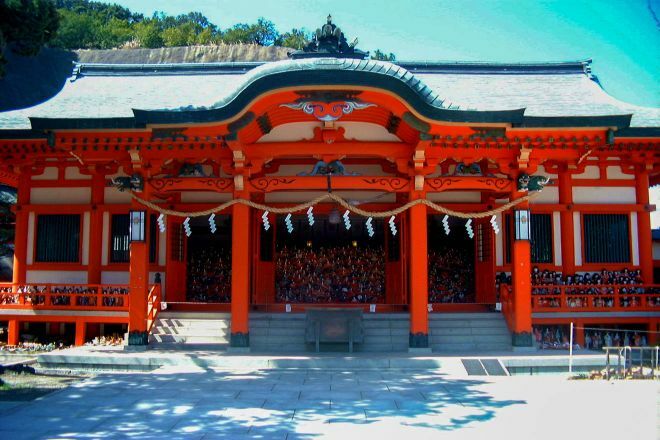 Awashima Shrine is in Kada region and other than the dolls, it is famous among women who go there to pray for different feminine problems, such as childbirth, infertility etc. How to get there: From Nankai Wakayama Station you take the train on KADA line to Kada Station. Price of the ticket is 300¥ one-way. 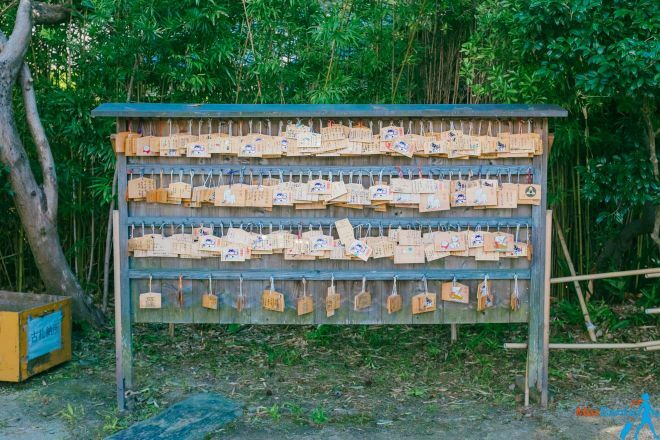 Awashima Shrine is a 15-minute walk from the train station. Wakayama is not only famous for its shrines and ramen, but also for the beautiful coastline full of nice beaches! Out of all the beaches in Wakayama, I really wanted to go to Kada beach, because it is so close to Awashima Shrine! 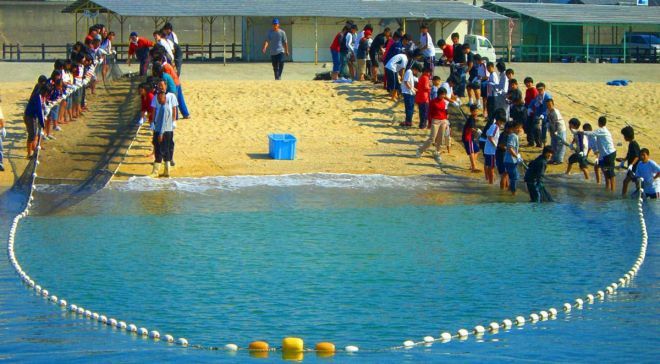 Kada is a Wakayama beach perfect for some sunbathing and relaxation and it is also child-friendly! The waters are calm and the beach has soft golden sand. 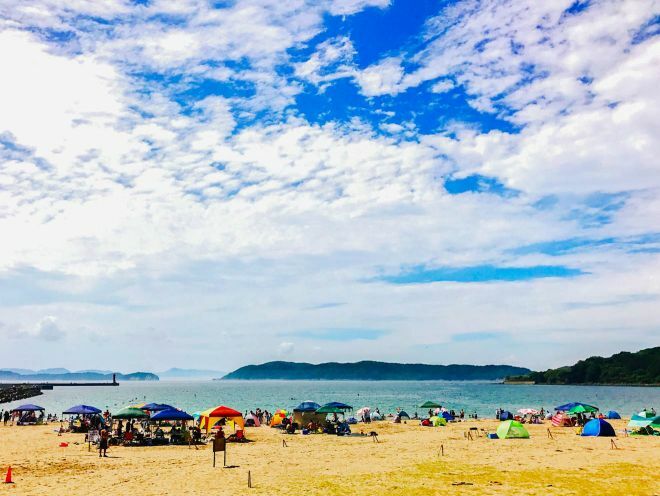 There are some other nice beaches that you can visit as well such as Kataonami Beach (10 minutes away from Tamatsushina Shrine and Furobashi bridge) or Isonoura Beach (1-minute away from Kada Station, close to Kada beach). How to get there: From Nankai Wakayama Station you take the train on KADA line to Kada Station. Price of the ticket is 300¥ one-way. Kada Beach is only 15 minutes away from the train station by foot. Seine fishing is the authentic way of fishing in Wakayama! This type of fishing includes a big fishnet called “seine” and multiple people using it at the same time. The fishing nets are deployed directly from the beach into the water. During this activity, you will get to catch some different types of fishes such as horse mackerel, octopus etc. 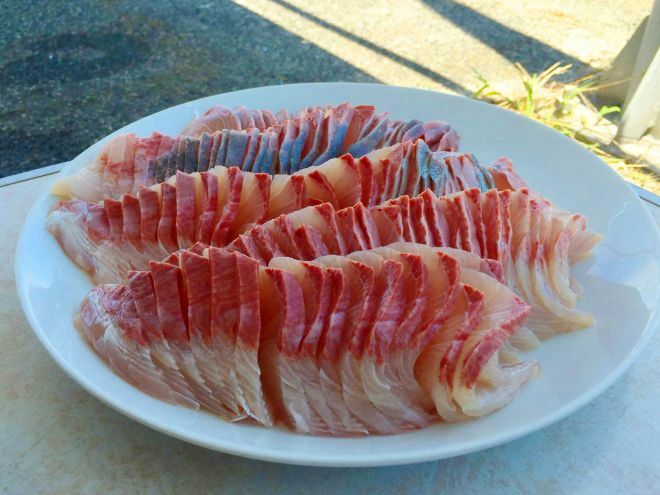 and then enjoy a delicious barbecue and sashimi with the freshly caught fish! You can also enjoy some other types of grilled fish, meat and vegetables for additional fees depending on your preferences. The fishing takes 30-40 minutes and the BBQ takes 60 minutes. How to get there: The meeting point is Kataonami Beach. To get there, you can take bus 24 (Platform 2) from Wakayama Station and get down at Furobashi station. The beach is a short walk from the bus station. Price: One fishing net is 75.600¥ which will be divided between all the people participating in the activity (the net can be used by 20-120 people). The BBQ is 1.800¥/person, excluding tax. For children it is 1.500¥, excluding tax. 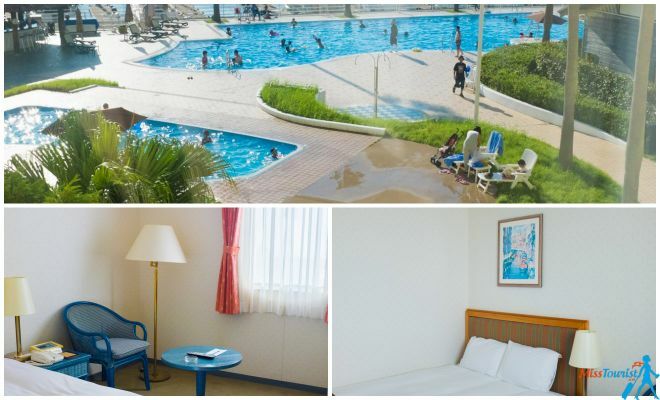 There are many hotels in Wakayama-City that you can choose from, for all types of budgets. Wakayama Marina City is a gorgeous hotel on Marina City complex, the artificial island located in the south of the city, half an hour away from Wakayama Station. I stayed here on my first day in Wakayama. The hotel has a very relaxed, it has a European vibe to it. 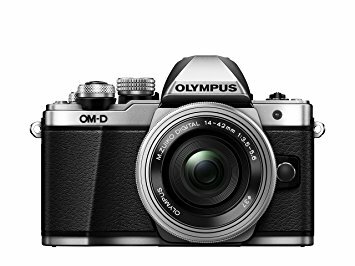 It is also colorful, chic and it provides excellent service! The rooms are very cozy (mine had a pool view which was super cool!) and the staff is extremely friendly. They helped me with everything I needed during my stay, including an electrical adapter and they spoke very good English. Daily activities at the hotel include sunbathing and bathing in the pool (which is open until 5PM), eating a delicious buffet breakfast or serving lunch at one of their restaurants (they have an Italian one and a Japanese one and a bakery) and just exploring the surrounding area including Kuroshio Market, Kinokuni Fruit Village, Porto Europa and Kishu Kuroshio Onsen. 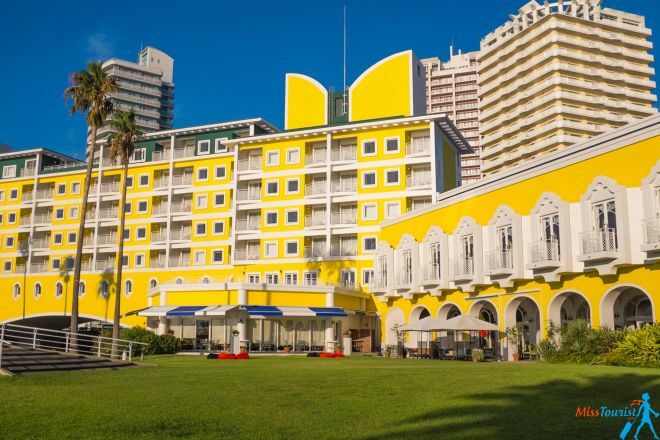 Your booking at this hotel also includes a free ticket to Porto Europa during your stay and a free ticket to the onsen, which is a great bonus (and a saving of about 4.500¥)! They also have some evening parties by the pool that you can join for an additional fee. When I was there, they had a Night Pool Party with some DJs and cool music and the entire pool area was full of young Japanese people enjoying the vibe! One of the best things about Wakayama Marina City is the daily breakfast, served between 7 AM – 10 AM. They invite tuna cutting masters from Kuroshio Market to present a tuna show and then you get to eat fresh tuna sushi at breakfast! How amazing is that? 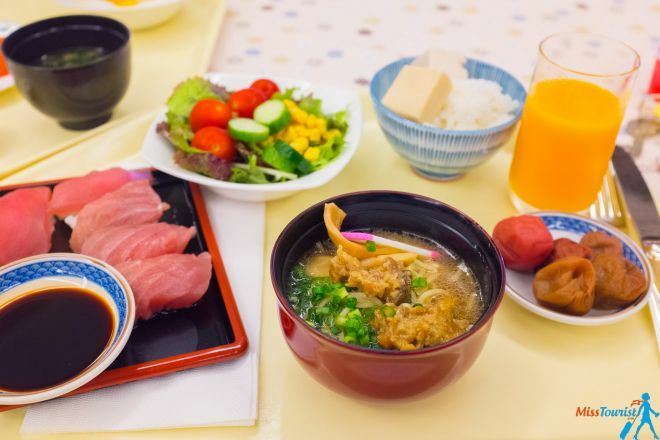 Other than the sushi, the breakfast options are very wide and it includes miso soup, salads, pastries, tofu, noodles and more! This was the place where I got to taste some Umeboshi pickled plums (unique taste and experience, by the way!). The rooms are sparkling clean, the toilets include a bathing tub and there is also a nice souvenir shop at the hotel where you can buy gifts and all kinds of snacks! My experience at Wakayama Marina City was super pleasant and I would go back in a minute! 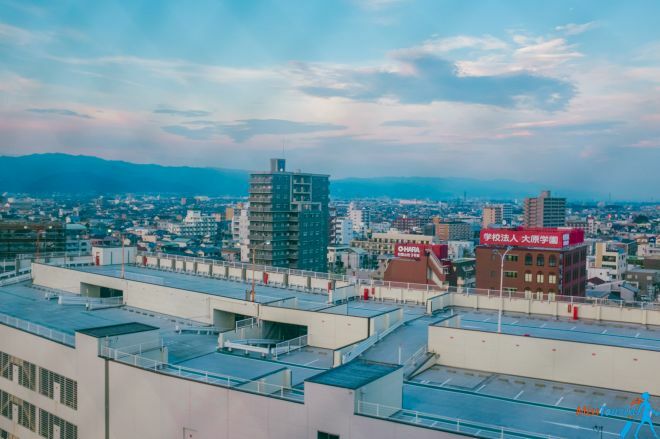 Even though Comfort Hotel Wakayama doesn’t have such a summer breeze vibe and isn’t surrounded by the ocean, it has an extremely convenient location: right near Wakayama Station, only 2 minutes away by foot! The hotel looks very good and I stayed here on my second day in the city and I really liked how easy it was to get around, to get to the main Wakayama attractions or to the airport. I decided to rent a bike from the hotel, as you can do this for free there and used it for the entire day. The breakfast options were very good as well, ranging from traditional Japanese buffet dishes such as noodles, onigiri, salads to pastries, coffee and juices. The daily breakfast is served between 6.30AM and 9.30AM. The rooms are very clean and tidy and all of them are air-conditioned. My room was on the last floor of the building and I had a stunning view over the city! 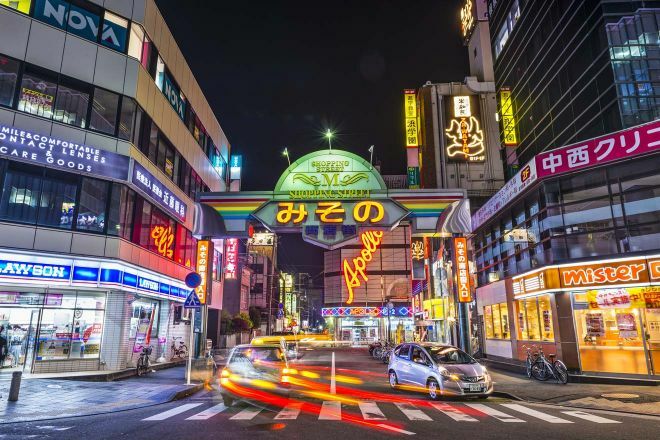 Another good thing about this hotel is that is only 1 minute away from Kintetsu Department Store, which is a very good shop, similar to a bigger supermarket where you can buy food, sweet drinks and souvenirs for convenient prices! 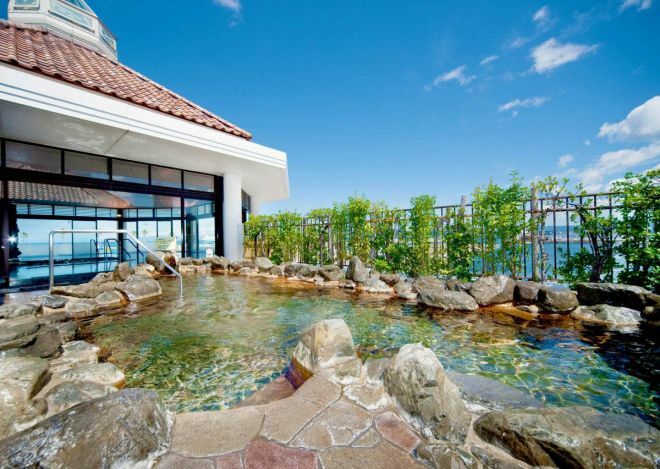 Luxury (170$ and up): Wakanoura Nature Resort Epicharis is a great luxury Wakayama hotel, located only 1 minute away from the beach. The rooms are very bright, cozy and super clean and the service is excellent! My second suggestion is Hotel Granvia Wakayama, a stunning 5-star hotel located 1 minute away from the train station! 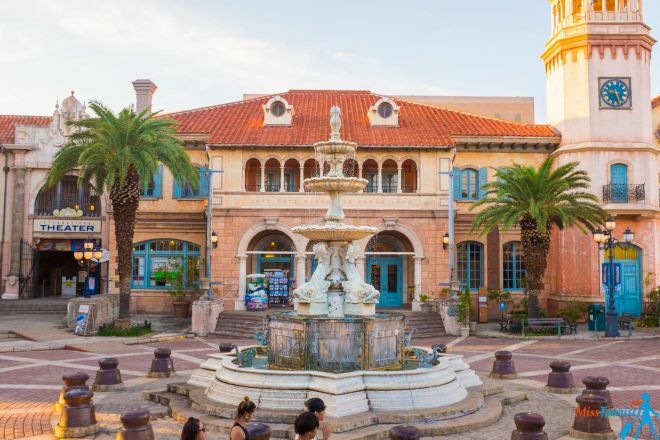 It features free bicycle rentals, stunning rooms, great service, and friendly staff! Middle-priced (between 110$ and 170$): Daiwa Roynet Hotel Wakayama is a very nice 4-star hotel situated only 1 minute away from Wakayama Castle. 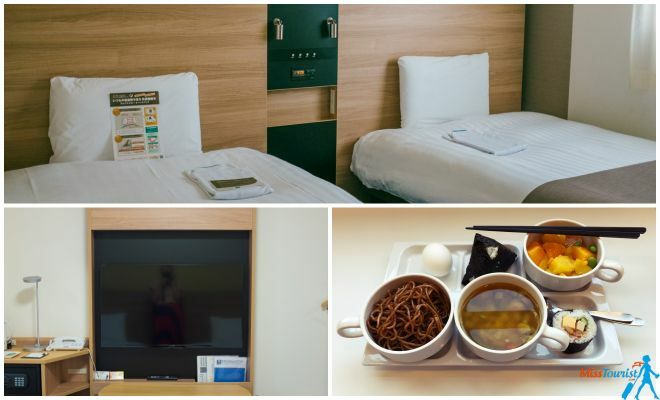 You will get to choose from 6 different restaurants and you will have everything you need for a pleasant stay! Wakayama Kada Onsen Kada Kaigetsu is located in Kada area, 12 minutes away from the beach. The hotel offers free pick-up shuttles from Kada Train Station and great service! 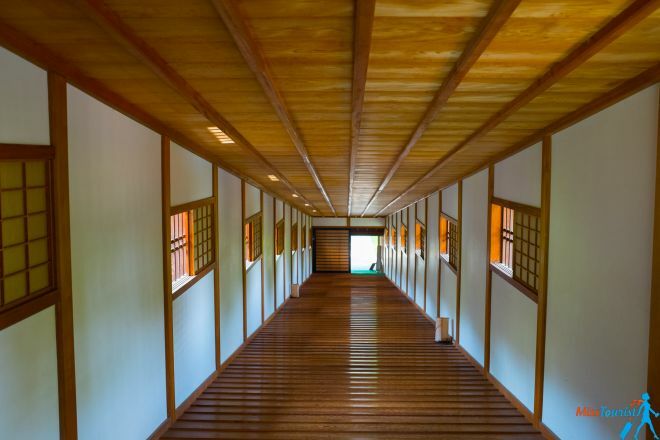 Budget (between 58$ and 110$): Tsukiji Hostel Wakayama 1 is a super nice hostel in Wakayama with traditional Japanese beds. The hostel provides a free shuttle service from Wakayama Station. Tsukiji Hostel Wakayama 2 is just as good as the first one! You can rent bikes for free there and you will get free Wi-Fi and a shared bathroom. Ajidokoro Mihanami – close to Wakayama Station. 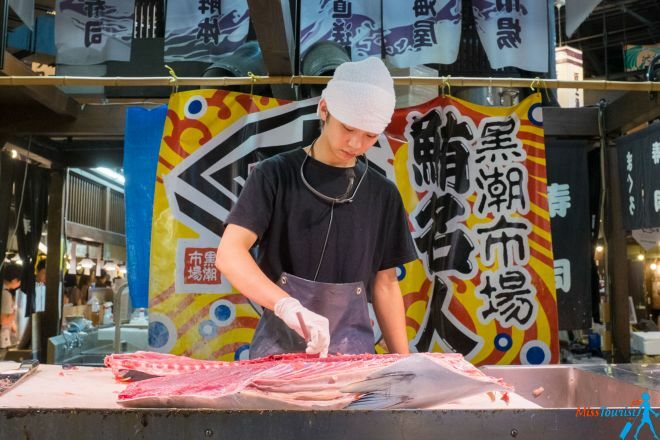 Go there for the “futomaki” – thick sushi roll filled with eel and tuna or you can try the Wagyu beef. Kyoubashi Koutaro – close to Wakayama Castle. Great ramen! South West Café – Go there for the fruit cocktails or just to have a drink and relax. Not far away from Wakayama Station. 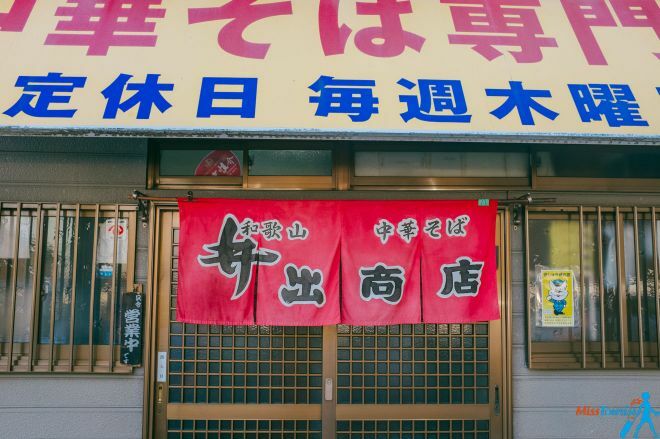 You can find other great places to eat in Wakayama here. 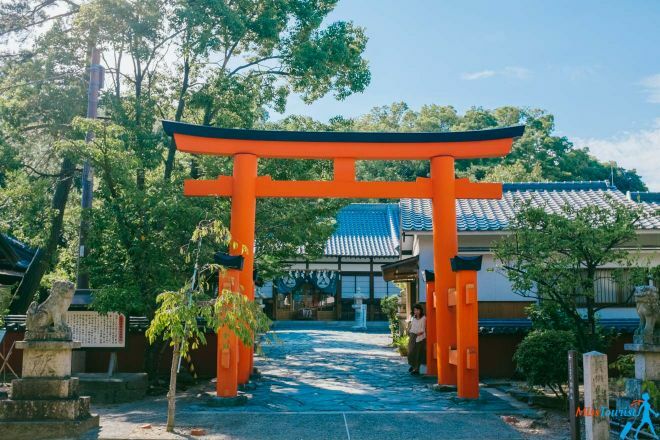 Wakayama attractions are kind of scattered around the city in different places, so you will need to make an itinerary for yourself and find the best way to reach from point A to point B. There are different areas of interest for tourists in the city such as the center (with Wakayama Castle, Momijidani Garden etc), Kada (the place where Awashima Shrine is and where you can take the ferry to Tomogashima Islands), Kimii-dera (where the famous Kimii-Dera Temple is located), and Marina City (south of Wakayama, the island-resort). It is quite easy to get around in Wakayama-City. I chose to rent a bike from Comfort City Hotel on my second day there (you can rent bikes for free at this hotel) so I could freely explore the streets at my own pace. You can also rent bikes from Wakayama City Tourist Information at Wakayama Castle for 500¥/day for a regular bike (tax included). Another option is to rent it from Wakayama Station, at Wakachika Hiroba (Tourist Exchange Center) in front of the train station. The fee is 500¥/day for the regular bike, 700¥ for the sports-type bike and 1.000¥ for the electric bike. 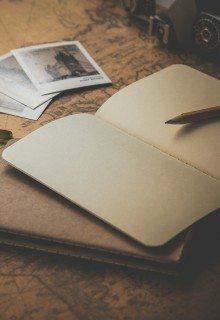 Even though I used a bike, I carefully took notes about other types of transport in the city so I can give you the right information for your trip. Taking a bus in Wakayama is as easy as in the rest of Japan and there are many options for different areas in the city. One good place to take the buses is Wakayama train station, as most of the buses have a stop there or they even depart from there. 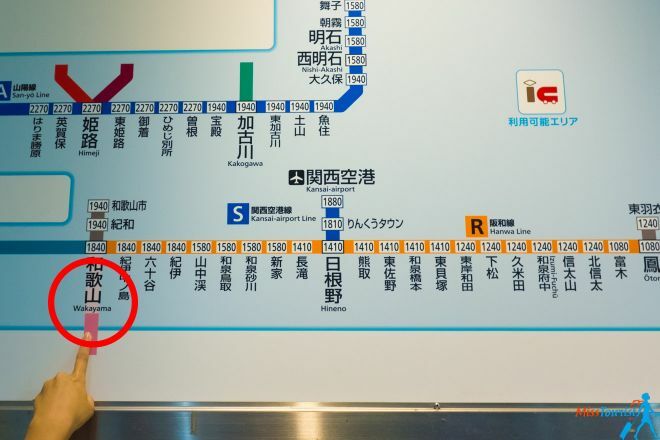 I also suggest you take the free Wakayama Transit map (pictured above) from the Information Point at Wakayama Station. It is very clear and easy to use! The buses are great, all of them are air-conditioned (this is great during summer when it is super hot!) and special buttons that you have to press when you want to get down. Don’t forget to press those red buttons, because otherwise, the bus won’t stop! Bus prices: Bus ride fares start from 210¥/person depending on your destination and they can go up to 520¥ (for Marina City, for example, which is farther away). I recommend you take the one-day bus pass if you are planning to use the bus multiple times a day. 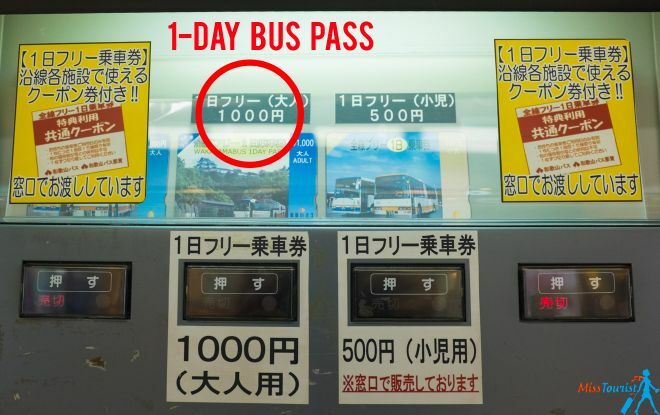 It is only 1.000¥ and you can use it for an entire day on all bus lines, no matter how many rides you take. Paying for the bus ride: In Japan, you have to pay for your ride before you get down of the bus, at the machine near the driver. The machine works only with coins, but it also has a special place where you can insert bigger bills and it will convert the bills to coins. Before you get down, the machine’s screen will show the amount of money you have to pay for your ride. As for the trains, this is also a very convenient way to get to different points in the city. 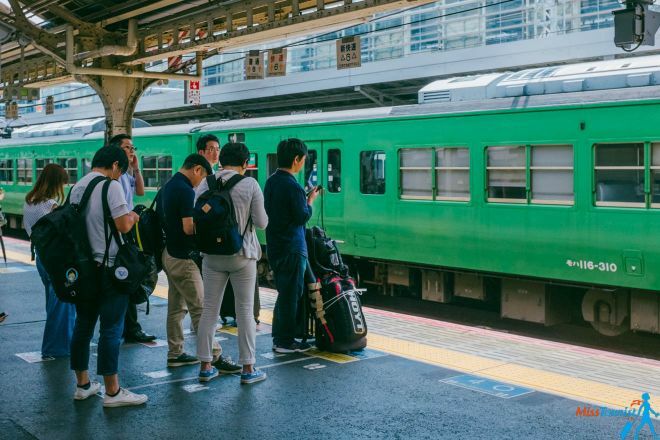 The trains are very punctual in all of Japan and in Wakayama as well. Train ticket prices: The ticket prices start at 190¥ and they go up depending on how far away your destination is. You can take trains to Kada area for 300¥, to Wakayama City Museum for 190¥, to Kishi Station to see the cat stationmaster for 400¥ or to Kimii-Dera for 190¥. Getting the train ticket: You have to buy your tickets from the train stations, from the special ticket machines. The process is very simple, you just have to select English and then select your destination. The machine will show you how much you have to pay and after you insert the coins or bill, you will get your ticket which you have to validate at the turnstiles. Make sure to keep your ticket, as you will have to insert it again at the destination station. 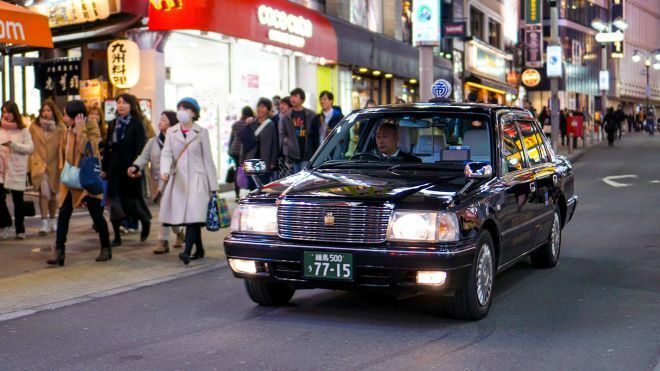 Another option is to install the app called JapanTaxi, which is like an Uber for Japan. Add your card and then order your taxi as you would do with any other taxi app. The fare will be automatically paid from your card at the end of the trip. This app works with all the taxi companies in the area, it is not dedicated to one company exclusively. Prices: Initial fare is 400¥, to which they add the Fare per km which is 200¥/km. For example, if you are going from Wakayama Station to Wakayama Castle (about 3km), you will pay around 1.000¥ (400¥ initial fare + 200¥ x 3km). Of course, this depends on how heavy the traffic is at that moment. Getting from Osaka to Wakayama requires changing 2 trains, but the ride is quite simple. 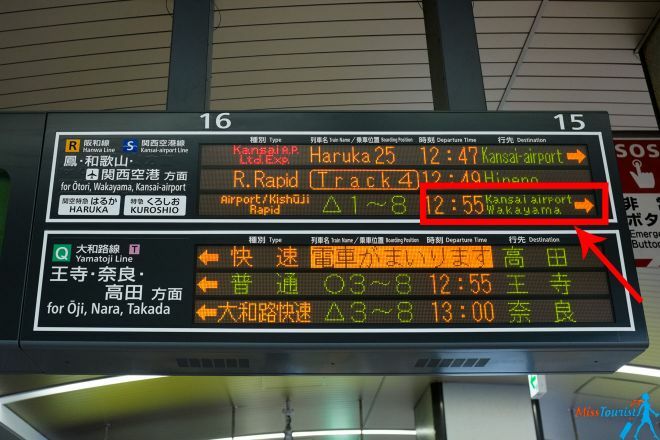 The total travel time is around 1 hour. You can use the website HyperDia (the search field on the top left corner) if you want to calculate your route, check the up-to-date prices and timetable. 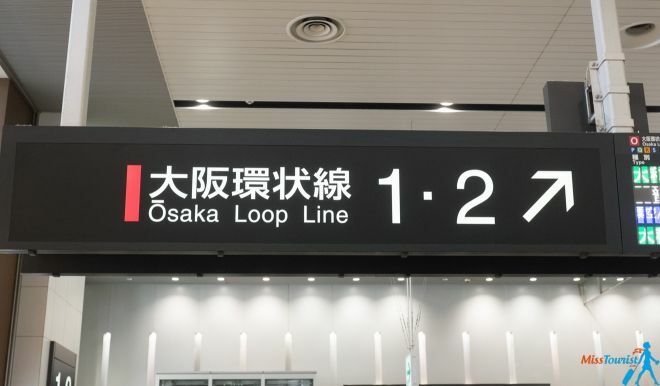 At Osaka Station, you have to take the red line “O” (Osaka loop line) with the direction Fukushima. Look for the signs guiding you to the red line O (1 and 2). From Platform 1, take the train for Tennoji. The ride takes 20 minutes. At Tennoji, take the orange line R. From platform 15, take the train to Wakayama Station (R54). You have to be very careful here because the same train will go both to Wakayama and to Kansai Airport. For the same train, half of the cars (marked with triangles on the train) are going to Wakayama, and half of them are going to the airport. For my train, cars 1-4 were going to the airport and cars 5-8 were going to Wakayama. When you reach Hineno Station, the train will split in 2 and you will continue your way to Wakayama. Don’t worry, as the voice announcement will clearly say your destination depending on the cars you are in. You can also change the cars while you are on the train. After this, you have to get down at Wakayama Station and you have arrived at your destination! From Kyoto you have to first get to Osaka, then follow the steps above to arrive at Wakayama. 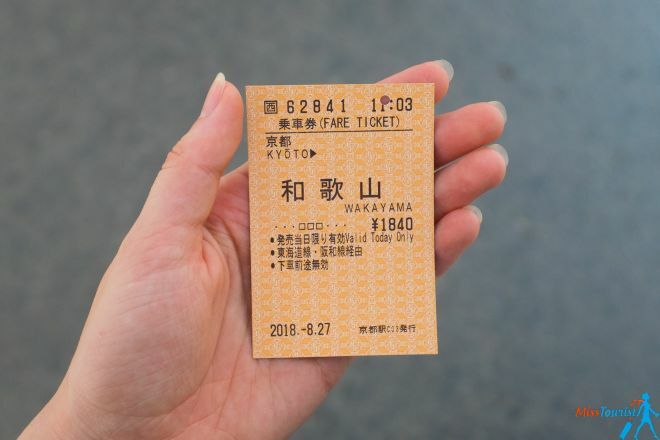 The ticket you buy will be directly for Wakayama, you don’t have to buy a new ticket at every train station. 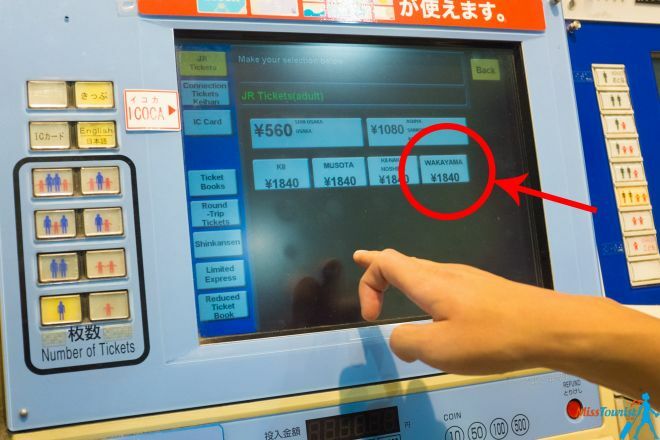 Buying the ticket: At Kyoto JR station, go to the vending machines and buy your ticket for Wakayama. 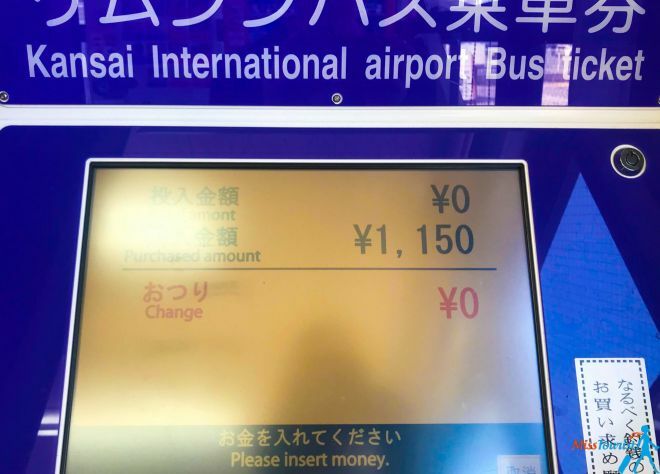 Select “English” -> JR tickets -> more than 840¥ -> select 1840¥ -> select Wakayama -> insert your coins or bills and pay for your ticket -> get the ticket -> put it in the machine and keep it. You will have to insert your ticket when you arrive at your destination. Getting to Osaka: At Kyoto Station, from lines 4 or 5 take the local or rapid train (it doesn’t matter) to Osaka. Price: 1.840¥ for the entire trip Kyoto – Wakayama. 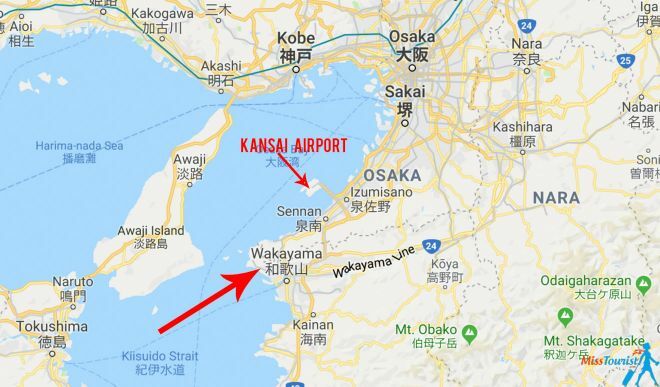 As Wakayama-City is only 40 minutes away from Osaka Kansai Airport, it will be easy to get there. Prices: Bus fare is 1.150¥ one-way and the train ticket is 890¥ one-way. Disclaimer: I was invited on this trip by My Secret Wakayama, a very nice project aiming to develop Wakayama tourism. All opinions are my own. 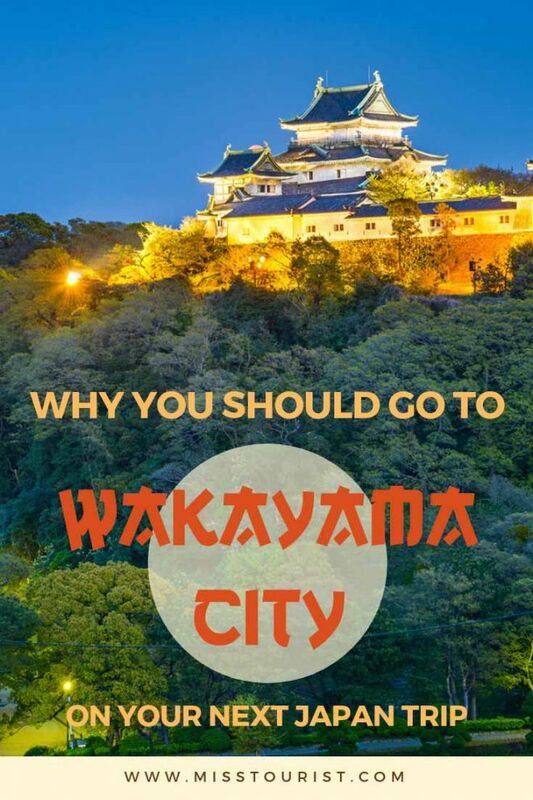 This was my list of reasons why you should include Wakayama City on your itinerary for your next Japan trip and some great things you can do and see there! 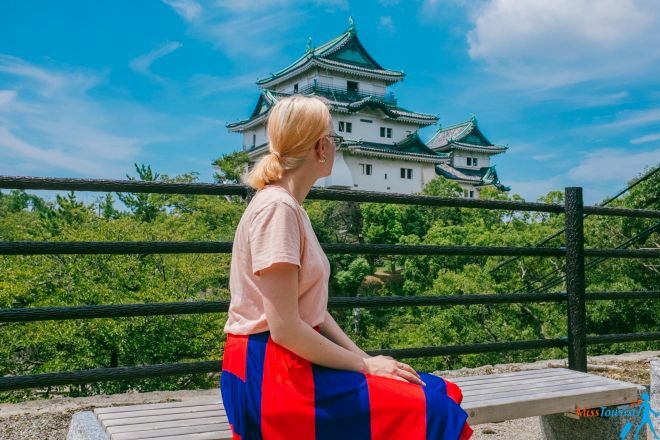 Although Wakayama is a small city, it is very close to Osaka and a great destination as there aren’t as many tourists there and you will get to experience the true Japanese vibe! 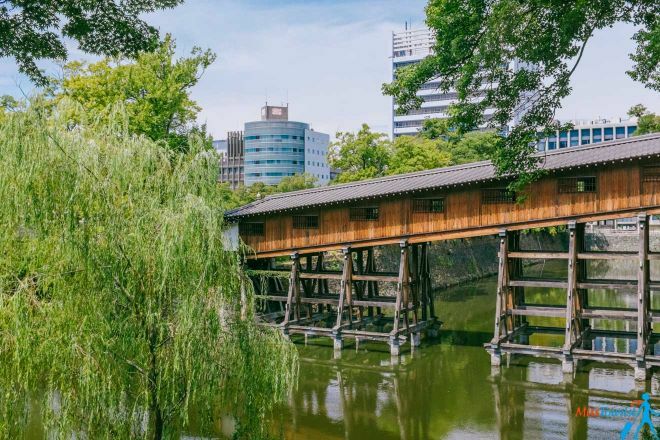 The city is very authentic, full of nice little red temples, beaches, onsens, good ramen restaurants and other attractions that can easily fill two days of exploring! I hope I convinced you that Wakayama is one of the most charming off-the-beaten-path places in Japan and that it deserves your time and attention! As always, if you have any questions or curiosities, you can leave them in the comments below. I am curious to know what you think about this wonderful city! My husband is from Wakayama. Made many trips there. I loved it! They have the best little noodle shop in the world there. People line up outside everyday for the ramen. 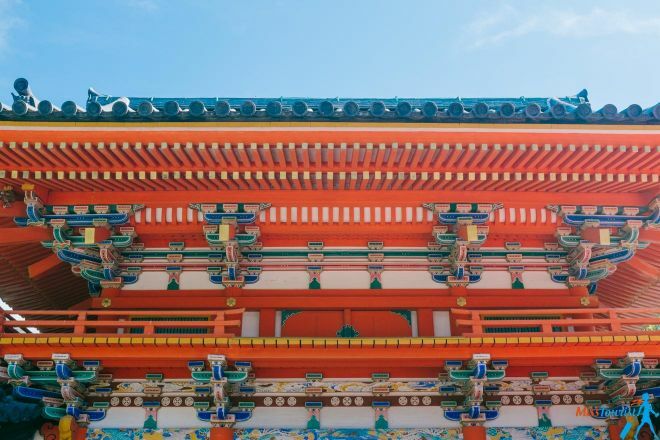 Wakayama is a great place to experience Japanese Culture without the crowds. One New Years Eve, I got to gong the bell at a shrine at midnight, it was an amazing experience! Beautiful City! Thank you for your comment, I’m glad you enjoyed the article! Thank you for the nice comment, I am very glad you enjoyed the article and that you want to go to Wakayama! The city definitely deserves it and I’m sure you feel like you have the place to yourself! I think it will be even more gorgeous if you are visiting at the end of March, during the cherry blossom (sakura) season! I hope you will enjoy your time in Japan!